Naxos or Axia is the largest island of the Cyclades in the Aegean Sea. Naxos, the Kallikratis Plan has a Municipality, the municipality of Naxos and Cyclades, Naxos based. The island has beautiful beaches, Saint George, Saint Prokopios, Agia Anna, Plaka, kastraki. 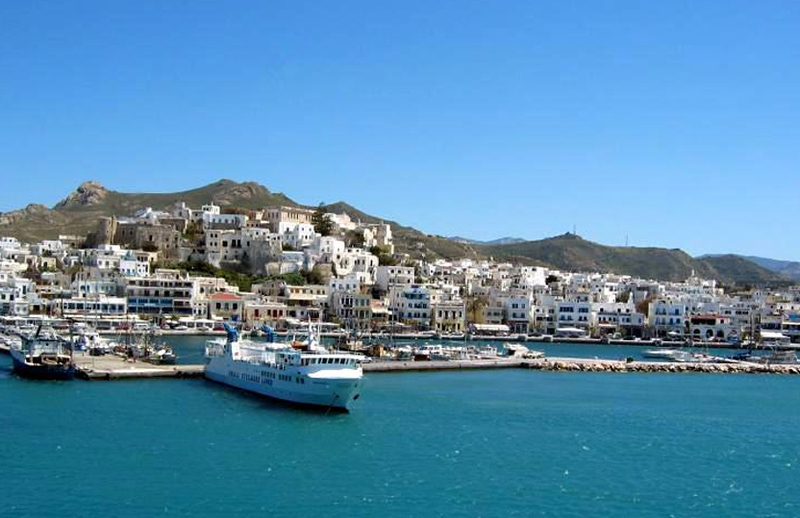 Naxos port serves passenger and merchant ships. Yet there is a pier for smaller boats and ferries ship endokykladikwn. Ferries connect on a daily basis the port of Naxos to Piraeus and other islands of the Cyclades. Buses serving the guests with services from the port to the country and the villages of Naxos. Become regular services to the areas ' Agios Prokopios, Agia Anna, Apiranthos, Apollonas, Halki, Fylwti, Mikri Vigla, Moytsoyna, Agios Arsenios, plate, Pyrgaki, Sagri, tripods. From the port leave and taxis transporting visitors around the island. Telephone number to call taxi is the 22850-22444. For information on arrivals and departures at the port of Naxos. Naxos port contact in phone 22850-22300.
daily departures from Naxos year-round for Piraeus and Rafina. There are also daily ferry connections with all the Cyclades, Paros, Syros, Mykonos,Tinos, Ios, Santorini, serifos, Milos, Amorgos and Koufonisia. The ferry companies approaching the port of Naxos and have started from the port of Piraeus is the Blue Star Ferries, Hellenic Seaways and Aegean Speed Lines. Air Champion24 .com offers ferries to and from Naxos on all services performed from any port of Greece. You can easily search and choose your ferry route that it serves, easily and instantly. The booking takes place in real time using your credit card or by making a booking with the help of the staff of our Office.